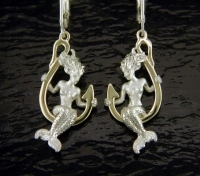 Lovely Sterling Sliver Mermaids sit on a 14k Gold Fish Hook. 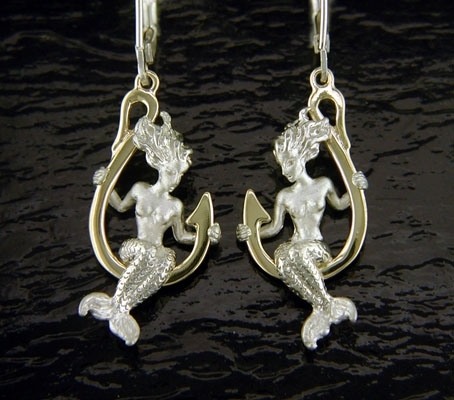 Earrings are crafted in solid Sterling Silver & 14k Yellow Gold. Each earring is approximately 1 1/2" from top to bottom and features a leverback finding. All earrings typically ship in 2 to 3 weeks. If time is essential, please contact us and we will be happy to let you know what is available for immediate shipment. Steven Douglas Company has achieved a worldwide reputation for creating jewelry of unsurpassed quality and intricate detail. Each piece is meticulously crafted from solid Sterling Silver & 14k gold. The Sterling Silver is clad with a heavy layer of Rhodium. Rhodium is universally used by top jewelry designers to accentuate the beauty of white gold. Finely crafted Sterling Silver jewelry is also coated with Rhodium to enhance it's natural beauty while minimizing any tarnishing. Unique and timeless in design, each piece is a tiny work of art.